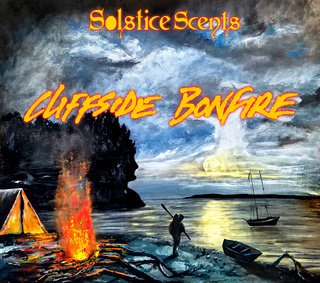 The Solstice Scents Late Summer release goes live at 7 pm EST at www.solsticescents.com. Most of the perfumes are perfect for transitioning from the still sweltering days of summer into the early days of the fall season. Several are reformulated and returning perfumes to our General Catalog. There are a few more traditional scents associated with summer but the majority of this collection focuses on the waning days of summer as we look ahead to the seasonal shift. All perfumes are available in sample format. Please be aware that EDPs are not available in sample 5 or 10 packs or as a free sample at checkout. EDPs are sold individually as 2.5 ml sprayers. 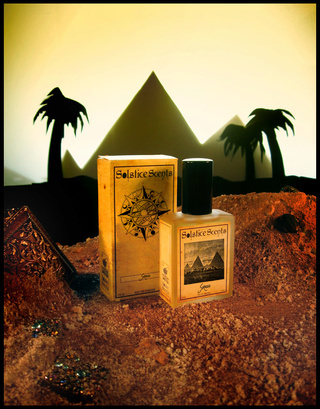 Desert Thunderstorm is an EDP exclusive and is only available in the 2.5 ml and 60 ml sizes. 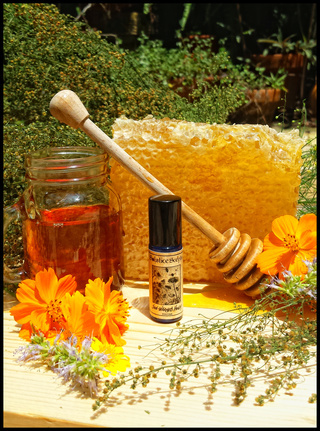 Perfumes offered in the 5 ml format are available in the 5 and 10 sampler pack and as a free sample at checkout. List your selections in the box. The perfumes below will not be on the sampler pack listing but ARE AVAILABLE in sample format. Savannah is not available in perfume format, only in Whipped Soap and Glace. Please pay attention to the offered formats for each item by looking at the end of the item description. DESERT THUNDERSTORM EAU DE PARFUM: Desert Sage, Pinyon Pine & Resin, Petrichor, Sweetgrass, Creosote Bush, Sand, Ponderosa Pine, and the scent of a distant canyon fire. This perfume has been slightly reformulated from the original. It is very similar to the 2015 version but not exact. Notes of pinon resin, pinon pine, desert sagebrush, petrichor, sweetgrass, creosote bush, sand, rabbitbrush, ponderosa pine and smoke from a canyon fire. This blend contains pinon resin that we gathered in New Mexico. It also contains a variety of essential oils from desert plants in New Mexico and Utah from a small artisanal distiller. The blend is primarily composed of essential oils but also contains a few synthetics. When first applied, you get a blast of rain and herbal sage, pine and a touch of creosote. It has a slight bit of High Desert odor but if High Desert were completely drowned in rain and had pinon, ponderosa and deep char notes. The smoke/fire accord is very resinous, like burning pitch. It is deep, not an acrid smoke or bbq but a thick sap on fire. It sits just at the base of this fragrance and is awash in rain and desert plants. The rain/creosote bush scent does not last for hours into the dry down aside from a trace but it is present for some time. The blend does eventually head more herbal and woody but there is no mistaking that through the whole wear of this perfume, you will pick up different desert elements. High Desert is more sage dominant but you can pick out the sage in Desert Thunderstorm as well. EDP ONLY. This perfume will be a part of our General Catalog. HIGH DESERT: Sagebrush, dry woods, cacti, sand, hay, smoke, tobacco, pinyon. This perfume has been slightly reformulated from the original. 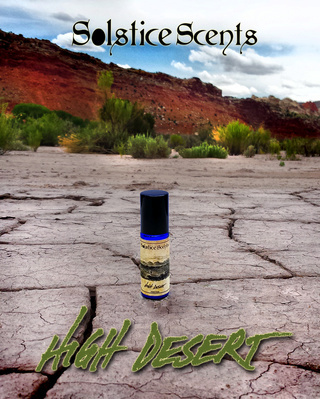 It is very similar to the previous version but not exact.High Desert is a dry, woody, herbal reverent blend designed to evoke the atmosphere of the hot unforgiving, yet majestic, desert habitat of the American southwest. It features dominant notes of herbal white sage and desert sagebrush with supporting background notes of soft woods, sweet Indian tobacco, hay, Saguaro cactus, juicy prickly pear cactus, baked sand and just a touch of smoke, labdanum and red musk. Despite the complex palette used to create High Desert, these notes were selected to enhance and compliment the beautiful sage blend. On cold sniff you will experience a dried sage leaf with a sweet fruity prickly pear top note and dry hay and tobacco finish. On initial application the crisp green Saguaro cactus emerges amidst an endless open blue sky. 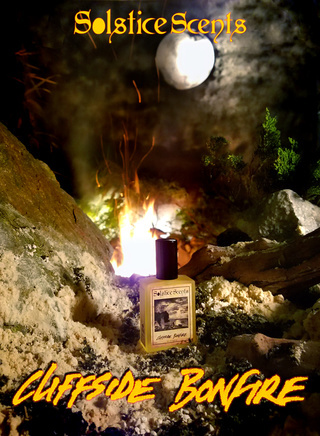 High Desert softens soon after application with emphasis on a blend of light woods and dry herbal sage with the occasional whiff of sweet tobacco and hay. The dry down hugs very close to the skin and liberal application is recommended to increase its strength and longevity. It does not morph significantly but after several hours the labdanum will be detectable. High Desert is a meditative, beautiful and very relaxing fragrance that is especially wonderful before bed. Atmospheric, Unisex. Perfume oil only. This perfume will be a part of our General Catalog. SACRED VOW: Natural perfume in organic cane sugar alcohol. Vanilla, amber, bay rum, sandalwood, oak, patchouli, vetiver, saffron lime and more. Sacred Vow is a warm, spicy and resinous natural perfume. A sweet, golden and lightly resinous amber accord forms the foundation of this perfume along with a smooth aged patchouli, sustainable sandalwood and a touch of oak and vetiver. Spicy bay rum is the heart of the perfume, smoothed by natural vanilla and a very light addition of jasmine and lavender absolute. Golden threads of saffron and top notes of fresh lime peel provide a bright contrast to this deep, base heavy blend. 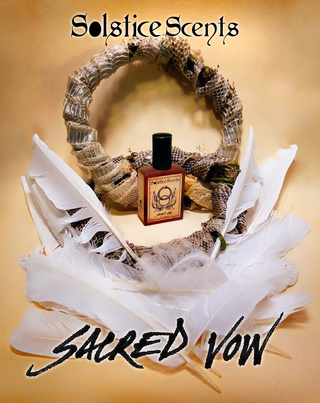 Sacred Vow is a distant, darker, less floral, companion perfume to White Feather. White Feather (EDP exclusive) is a jasmine-heavy, strong and narcotic floriental. Sacred Vow is more of an amber focused Oriental blend with the faintest trace of floral notes. It leans more traditionally unisex or "masculine" than White Feather. Offered in alcohol based roll on and EDP formats. SEA OF GRAY: Vanilla rain, saltwater, seaweed, ambergris (vegan), white amber, roasted seashells, white sandalwood, frangipani. Alcohol based perfume. Sea of Gray is the first offering in our Light and Shadows: Amber series which focuses on gradations of light. Each offering includes a style of amber and there will be one release per season. Sea of Gray portrays diffuse light through a cloudy sky: gray, rainy, endless rolling sea. The ambers featured in this blend are an ambergris accord and a fresh creamy white amber. 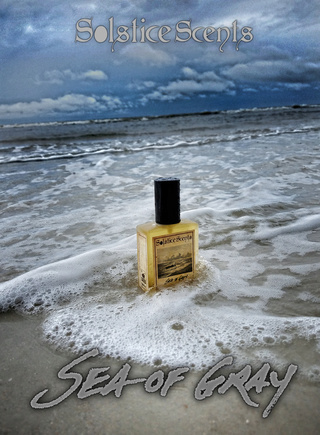 Upon initial application, Sea of Gray features a strong combo of vanilla rain, roasted seashells, saltwater and seaweed. The seaweed and roasted seashells provided a briny marine note with the salt water but the vanilla is in the foreground. This is a marine vanilla with a light drizzle of rain. As it begins to rain, the oceanic elements recede like a tide as you seek refuge in the beachside ice cream parlor. The scent of the cold ice cream freezers and a sweet vanillic odor typical of ice cream shops comes to the foreground. It mingles with the saltwater that has dried on your skin and clings to your towel. The white amber comes out more on the dry down which is a creamy, sweet, slightly salty vanilla. The sandalwood and ambergris are used very lightly in this formula. The frangipani is extremely subtle and is not very detectable. This is not a floral perfume. It does not resemble Blackburn's Parlor which is a pure gourmand, uses a different blend of vanillas and is meant to represent the waffle cone sundae. Sea of Gray is more about walking into the parlor itself, complete with the cold scent on the air and a vague sweetness that most parlors always have. It is a more atmospheric concept though still pretty literal. Some of you may recall me mentioning the Light and Shadows series publicly at the beginning of the year. This series has been under construction for about 2 years. The next perfume in this series will be released in fall. It represents SHADOWS and will feature a rich, warm and golden amber. Winter will showcase FULL DARK with a smoky and resinous amber perfume. Spring focuses on a white amber perfume to represent WHITE LIGHT. Each perfume loosely incorporates elements and a nod to the season in which it is released. Sea of Gray (DIFFUSE LIGHT) features water: rain and ocean and contains a spirit of summer. It's an odd juxtaposition of melancholy and joyous pleasure. SIROCCO: Baked desert sand, sandalwood, saffron threads, myrrh, oud, jasmine, vetiver, patchouli, a touch of incense and Middle Eastern spices. Sirocco has been completely reformulated in 2015. It is a blend of sandalwood, precious saffron threads, hot baked Earth, myrrh resin, spices and a touch of oud and jasmine which meld together to create a dry, woody, resinous and spicy scent representing the blisteringly hot desert, spice caravans and never ending sun scorched sand. The woods and spices on cold sniff and initial application quickly turn dry and resinous as the saffron and myrrh boldly emerge. A hot Mediterranean wind stirs desert sands, fusing with the incense wood notes. Sirocco combines sandalwood essential oil and fragrance with a baked Earth Indian attar, myrrh and saffron essential oils and a medley of spices with a faint trace of sweet jasmine absolute. Very subtle additions of aged patchouli, vetiver, cardamom, rose and labdanum essential oils and absolutes add supporting depth though the main notes to be detected are the aforementioned. The dry down is warm, sandy, woody and spicy. Sirocco does lean a bit masculine but it is a very unique fragrance that Women would love to journey with as well. Not to be used by women who are pregnant or nursing. This perfume no longer contains pink lotus attar but it is very similar to the original. Nighttime island breeze carries sweet coconut flesh, delicate tuberose blossoms, Tahitian Gardenia flowers and pressed lime juice.Tropical Moon smells like an exotic beach paradise. It is sweet with creamy white floral notes with a top note of lime peel. 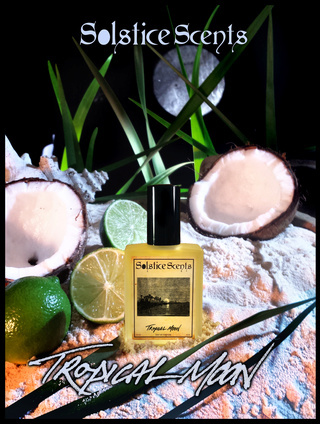 Contains real tropical monoi (Tahitian Gardenia blossoms infused in fragrant coconut oil), mouthwatering lime essential oil a blend of synthetic fragrance oils. Initial application has equal parts of coconut and tuberose with the lime hovering just above. The lime burns off relatively quickly in the leave on formats but does have a gentle presence in the whipped soap. The dry down is a fairly constant blend of coconut and tuberose without a great deal of morphing that translates as a soft and creamy tropical fragrance. Offered in perfume oil, Glace, Whipped Soap and debuting for the first time in EDP. FLORIDA FRUIT STAND: Watermelon, banana, strawberry, blood orange, lemon. Watermelon and banana are the dominant notes. The strawberry, blood orange and lemon are subtle. (Whipped Soap only. Not recommended for use prior to prolonged sun exposure due to citrus content). ROOT BEER FLOAT: Root beer, vanilla bean and vanilla ice cream. Very strong and refreshing root beer soap! (Whipped Soap only). SAVANNAH: Violet, moss, tuberose, hyacinth, pear, lily of the valley. (Whipped Soap and Glace only). An old scent from many summer's past is returning in Whipped Soap and Glace format only (no perfume or perfume samples). Savannah opens with a fresh burst of violet, mellow moss, delicate tuberose and the contest suggestion of rain in the background. The other floral notes and pear are subtle. This is a very cool-toned, slightly fresh and deep scent - a mossy floral. Elegant, timeless, sophisticated and genteel, Savannah is a glorious combination of purple violet flowers, moss, tuberose, lily of the valley and a hint of crisp Bartlett pear. TENEBROUS MIST and PHARAOH will be available in Glace format. Limited quantities if whipped soap and Glace available. Not available in perfume format or samples.